Get immediate savings by purchasing a Waitomo Caves holiday package. Just pick out your favourite options and let Expedia do the rest. Wouldn't it be nice to save up to $200*? Buy a package deal on Expedia today! Our extensive database provides more than 400 partner airlines and 321 000 worldwide properties. With such a wide range to choose from, you can't go wrong! If you have to change your travel plans, we will honour your cancellation request on nearly all bookings with no hidden fees. There are heaps of wonderful things you can do when you visit a new place. So why not get your trip to Waitomo Caves off to a sensational start by perusing some of our top tips? After all – out there starts here! Scramble through the passageways, shafts and tunnels at Waitomo Glowworm Caves. If you're feeling brave, switch off your flashlight and spend a couple of seconds in complete darkness. There's a great range of things to keep you busy in this destination. Explore the subterranean tunnels and passageways at Aranui Cave. If you dare, flick off your flashlight and spend a few seconds in the silent, inky blackness. Still got some time to spare? Let your inner adventurer off the leash at Waitomo Glowworm Caves Visitor Centre. Just be sure to take a torch! No matter how extraordinary your hotel is, don't spend your escape holed up in your room or snoozing beside the pool. There are so many incredible experiences to be had! Check out the Waitomo Caves things to do page for a full list. 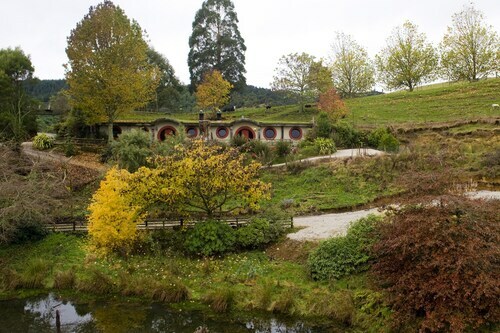 On your way to Waitomo Caves? It'd be wise to secure a room for your cheap holiday or luxury getaway as soon as you can. There are only 2 properties currently available. The Waitomo Top 10 Holiday Park (12 Waitomo Caves Road) and the Waitomo Caves Hotel (School Access Road) are popular with travellers. Working out the logistics of your trip to Waitomo Caves? Wondering where you'll be flying into? Hamilton International Airport (HLZ) is your closest option. Once you've got your feet on the ground and wandered out of the gate, you'll be 30 miles (48 km) from the happening main streets. 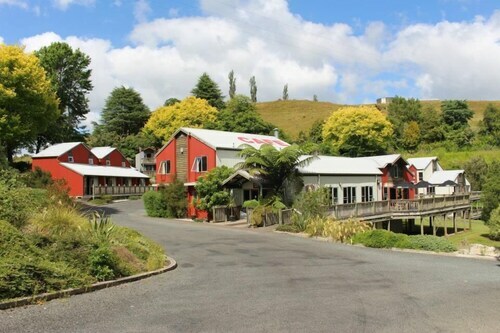 Situated in Waitomo Caves, this hotel is steps from Caveworld and Waitomo Glowworm Caves. Waitomo Glowworm Caves Visitor Centre and Woodlyn Park are also within 1 mi (2 km). Situated in Waitomo Caves, this motel is within a 10-minute walk of Waitomo Glowworm Caves Visitor Centre and Waitomo Glowworm Caves. Caveworld and Woodlyn Park are also within 15 minutes. Situated in Waitomo Caves, this hostel is within a 10-minute walk of Waitomo Glowworm Caves Visitor Centre and Waitomo Glowworm Caves. Caveworld and Woodlyn Park are also within 1 mi (2 km). 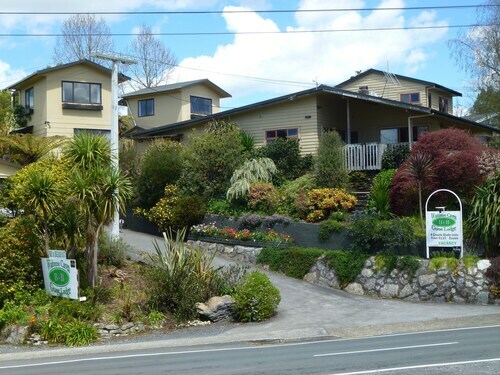 Situated in Waitomo Caves, this golf bed & breakfast is within 9 mi (15 km) of Kiwi House Native Bird Park, Waitomo Glowworm Caves, and Waitomo Glowworm Caves Visitor Centre. Caveworld and Woodlyn Park are also within 9 mi (15 km). 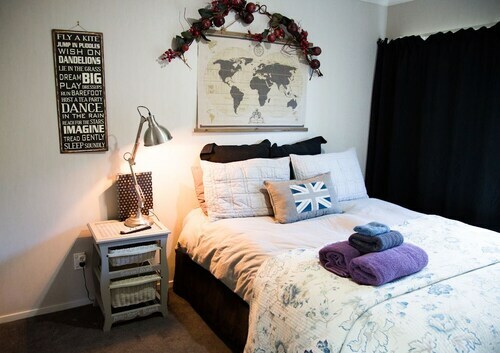 Situated in Waitomo Caves, this guesthouse is within a 5-minute walk of Waitomo Glowworm Caves Visitor Centre and Caveworld. Waitomo Glowworm Caves and Woodlyn Park are also within 15 minutes. 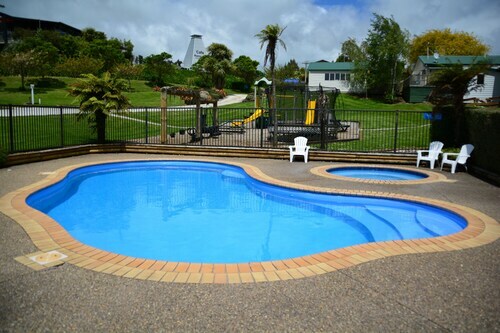 Situated in Waitomo Caves, this apartment building is within 1 mi (2 km) of Woodlyn Park and Waitomo Glowworm Caves. Waitomo Glowworm Caves Visitor Centre and Caveworld are also within 1 mi (2 km). 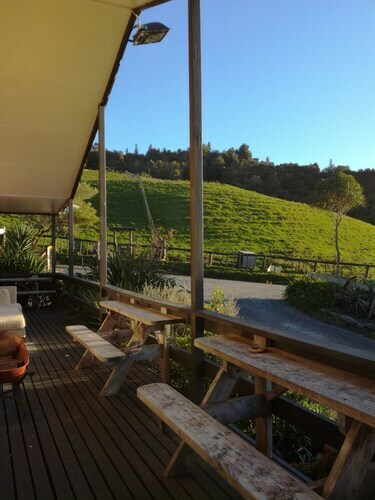 Situated in Waitomo Caves, this hostel is within 1 mi (2 km) of Waitomo Glowworm Caves Visitor Centre and Waitomo Glowworm Caves. Caveworld and Woodlyn Park are also within 2 mi (3 km). 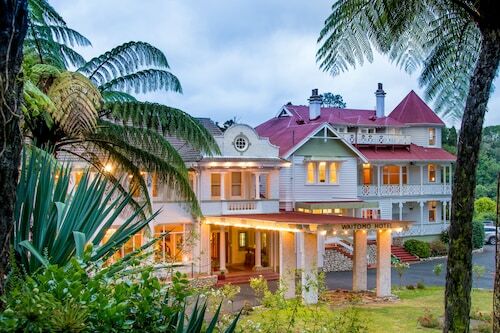 Situated in Te Kuiti, this hotel is within 16 mi (25 km) of Waitomo Glowworm Caves Visitor Centre, Waitomo Glowworm Caves, and Caveworld. Woodlyn Park and Kiwi House Native Bird Park are also within 16 mi (25 km). Sat., 1 Jun. - Tue., 19 Nov.
Fri., 9 Aug. - Tue., 13 Aug. Thu., 14 Nov. - Tue., 19 Nov. 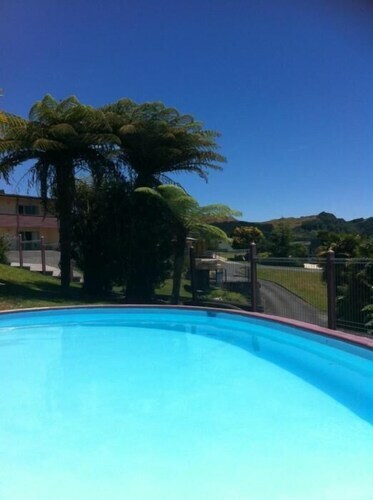 Looking for Flights, Hotels, Car Hire and Holiday Rentals in Waitomo Caves?